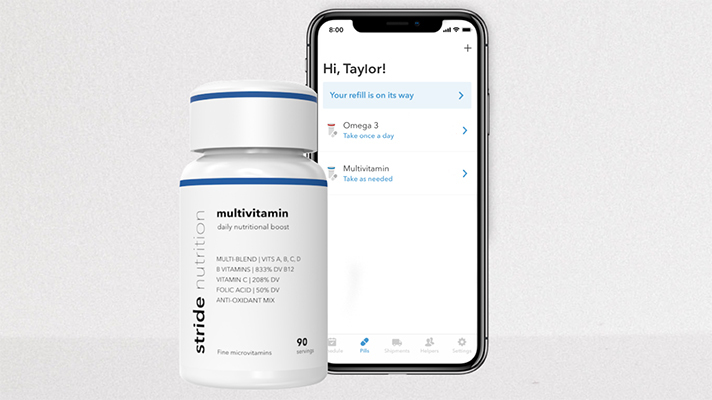 Stride Nutrition, a subsidiary of Pillsy, will combine the adherence technology with various mail-order nutritional products. Smart pill bottle cap maker Pillsy has launched a subsidiary that will pair the adherence technology with a nutritional supplement subscription service. Called Stride Nutrition, the service is now available for consumers in the US with plans to expand internationally in 2019. At launch, Stride’s service will have consumers sign up for one of three different supplement combinations: a multivitamin blend, an Omega 3 blend and a probiotic blend. According to the company, nootropic and prenatal supplement combinations are also available for preorder. Along with their 90 tablets, customers will receive one of Pillsy’s smart caps with their first shipment. The device, when paired with the mobile app, tracks doses so that it can send users’ a reminder when necessary and automatically order a refill when the supply runs low. In addition, the platform allows users to manage their dosage by viewing their adherence history or sharing their information with caregivers. "Stride is more than just a tablet or capsule. It's an entire technology-enabled service – a digital assistant of sorts that can help you manage various aspects of your nutrition," Jeff LeBrun, CEO of Pillsy and Stride Nutrition, told MobiHealthNews in an email. "This starts with taking them when you're supposed to, and refilling when you need more, but it also includes continuing education about the product – which is something that several well-known brands have approached us to discuss. The dietary supplement market is substantial, with one report anticipating a nearly $280 billion industry by 2024. With a variety of supplement delivery and personalization services already established, Pillsy’s new venture will be an indicator of how much space is left in the market, and how much value consumers place in the company’s smart packaging platform. “Many of us who have tried subscribing to a consumable subscription product, including mail-order prescriptions, have experienced a similar problem: we miss doses, and so the item stockpiles and takes up space. For that reason, several PBMs we've talked to have expressed interest in this technology’s ability to reduce unnecessary drug waste," LeBrun said. "The same underlying platform is also being applied to pharmaceuticals and it could be applied to other consumable products too." Much like Stride, others in the nutritional supplement subscription service space have latch onto a unique angle or technology when marketing their product. GYFT Baby, for instance, caters specifically to expecting mothers with pregnancy-minded nutritional supplements and a mindfulness app that includes relevant health information for mothers to be. Wellnicity, on the other hand, relies on its mail-order lab test platform to personalize its products for each specific customer.